***You can purchase an INEXPENSIVE AD-FREE PDF of this pattern on Etsy HERE and on LoveKnitting HERE! This beautifully formatted PDF includes the step-by-step pictures and pattern and is a total of 4 pages including the cover page! You can also find this pattern in my Easy & Modern Knits Pattern Bundle found HERE (includes over 15 of my knit patterns at a discounted price)! Lion Brand Yarn has made a convenient kit HERE that includes the pattern and ALL the Touch of Mohair yarn needed to make this luxurious scarf! Lion Brand Yarn is always coming up with new yarns and compositions, and one new fiber that stood out to me was “Touch of Mohair”. Mohair is a silk-like fabric or yarn made from the hair of the Angora goat, and it is known for its high luster, sheen, and durability. 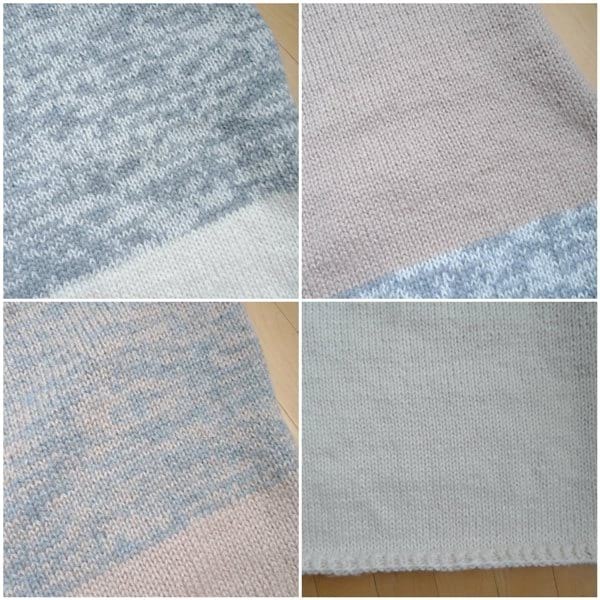 Touch of Mohair comes in such gorgeous shades, and these three named “Gardenia“, “Light Taupe” and “Oxford Grey” were right up my alley! Touch of Mohair is classified as a level 3 lightweight yarn with a 90% acrylic, 10% mohair composition. The mohair gives the yarn such a soft halo and just the perfect amount of fuzz. 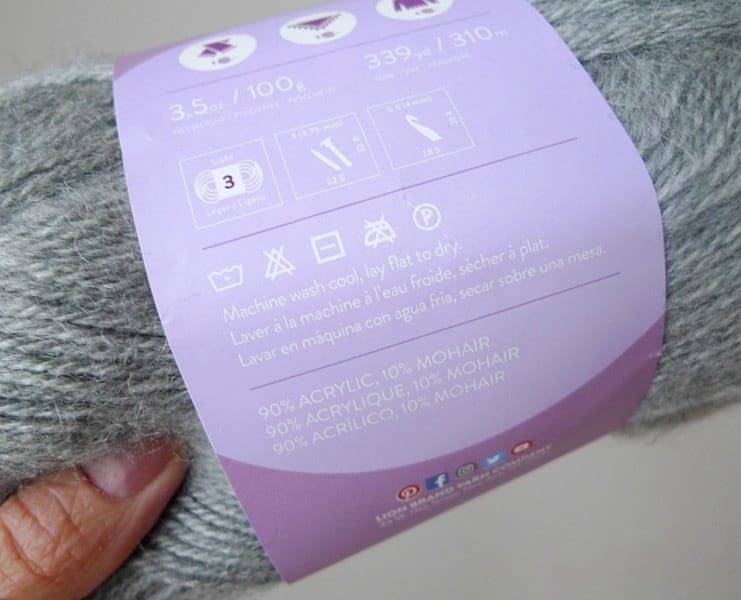 The acrylic means you can machine wash pieces made with this yarn as you can see on the label. It is a great way to try out a luxurious fibre at an affordable price! During the summer and early fall, Ryan and I watched a Mandarin Chinese television series called “Meteor Garden” on Netflix (the updated 2018 version of the popular 2001 Taiwanese show). In one of the episodes, Ryan and I noticed one of the stylish main characters wearing a stunning colour-blocked statement scarf where the neutral shades sometimes blended with each other. As soon as I saw this scarf, I knew that Touch of Mohair would be perfect for it, and we embarked on trying to create our own beautiful scarf (the main character wearing this scarf was male, so this could totally be a unisex scarf)! I started off by holding two strands of the white together. Since the majority of the scarf is worked in stockinette stitch, I wanted a light ribbing at the bottom to try and prevent the ends from curling too much. As you can see, we made this scarf extra wide since we knew the sides of the scarf would also curl due to the inherent nature of stockinette. As a reminder, stockinette is worked by knitting all the stitches of one row, and then purling all the stitches of the subsequent row. 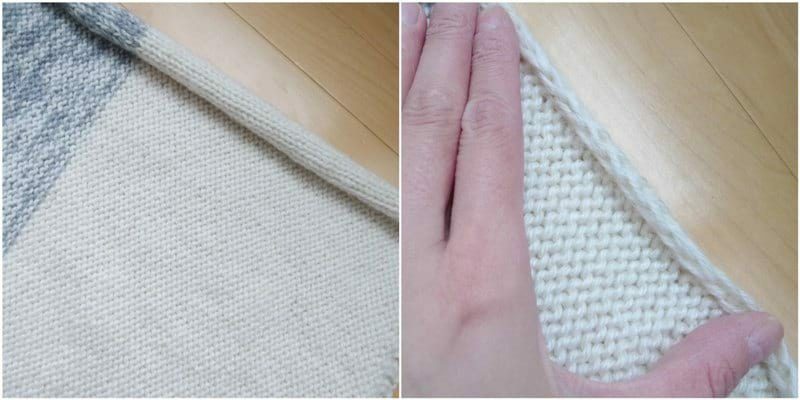 You can find my detailed “How to Knit the Stockinette Stitch” blog post and video tutorial HERE! To start the second section, I dropped one strand of the white and picked up one strand of grey. I held these two yarns together and loved seeing the mix of colours. The sections that had two different colours were my favourite to knit! For the third section, I held two strands of the taupe together, and for the fourth section, I held one strand of taupe and one strand of white. I then repeated these 4 sections once more, and then ended off with the white again. I slipped the first stitch either knitwise or purlwise to get these clean edges along the sides as shown below! This project has the most rows I have ever knitted before in a project! I felt so accomplished whenever I finished one block of colour. To help tackle this large-scale project, I kept a note on my phone, breaking this scarf down into chunks, such as 20 rows. For example, I would have “Rows 1-20, 21-40, 41-60, etc.” and I would check off each tab whenever I finished twenty rows. After knitting my entire scarf, I was so excited to try it on and wrap myself in this gorgeousness! ***You can purchase an INEXPENSIVE AD-FREE PDF of this pattern on Etsy HERE ! This beautifully formatted PDF includes the step-by-step pictures and is a total of 4 pages including the cover page! You can also purchase a kit HERE on the Lion Brand Yarn website that includes the pattern and all the Touch of Mohair yarn needed to make this luxurious scarf! The Longbourn Scarf is an elegant and gorgeous statement scarf that is knit using 3 different shades of Touch of Mohair yarn! The neutral and modern colourway makes this scarf a classic in any wardrobe as it can be worn over different coats. Minimal ribbing is worked on either end with the majority of the scarf knit in relaxing stockinette stitch. The extra width and length give the Longbourn Scarf a cozy feel as it can be looped around the neck for added warmth! 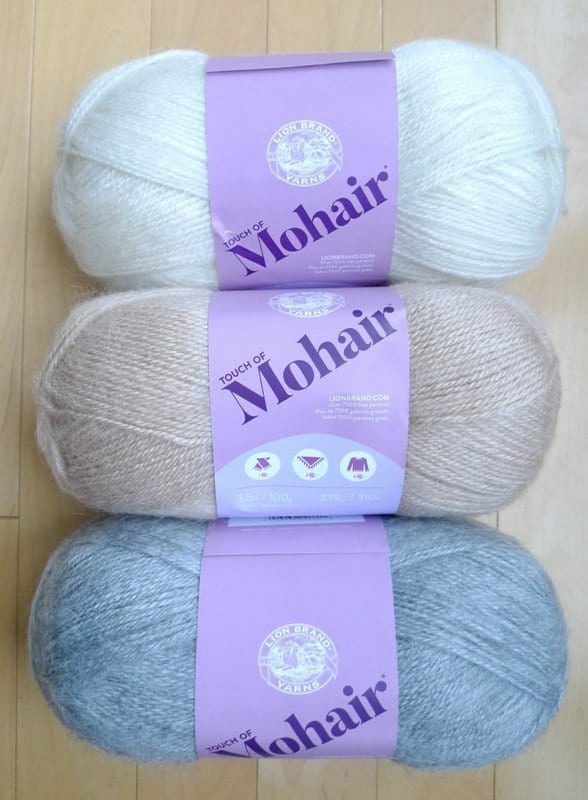 purchase the convenient KIT HERE that contains all the gorgeous Touch of Mohair yarn you need! Two strands of yarn are held together to create this gorgeous and luxurious scarf. See instructions below to see which colors are held together for each section. 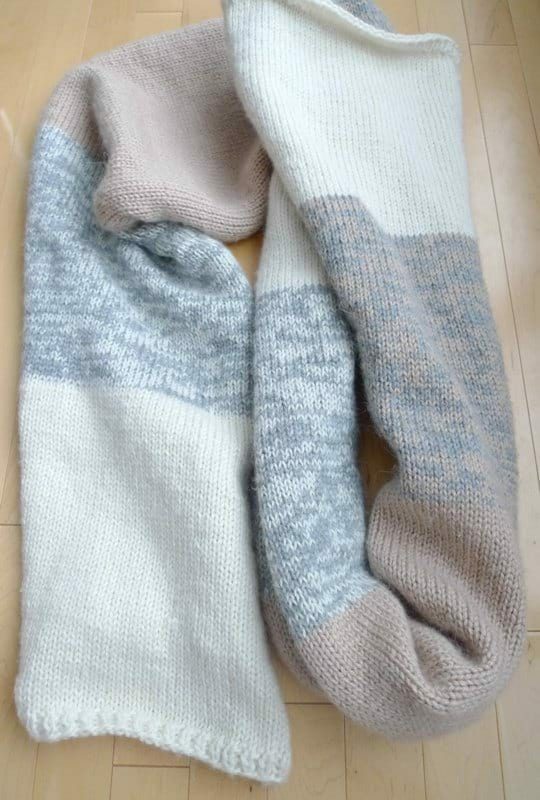 If you are using the kit and you would like to make the scarf longer, you can add more rows to any of the tan and tan/grey sections as there is left-over yarn (the white yarn is maximized in this design). Ribbing is knitted at the very beginning and very end of the scarf for 3 rows to help prevent curling. The rest of the scarf is knitted in stockinette stitch (alternating rows of knit stitches and purl stitches). At the beginning of each odd (purl) row, slip the first stitch purlwise. At the beginning of each even (knit) row, slip the first stitch knitwise. This helps create a clean and smooth edge on either side of the scarf. Each colour change is worked during an even (knit) row. 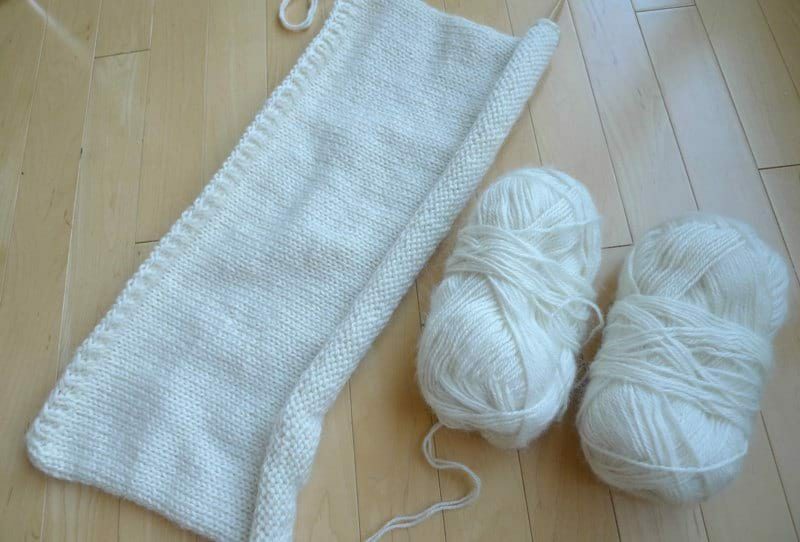 The sides of the scarf will naturally roll inwards due to the inherent nature of the stockinette stitch. This scarf is designed to be extra wide to compensate for this curling. Weave the yarn ends into the rolled edges of the scarf. Break the sections down into chunks (e.g. 20 rows) and use stitch markers along the edge to help keep track of the number of rows. Cast on 81 stitches using long tail cast-on. Row 1: Slip first stitch purlwise. *P1, K1* across, Purl last 2 stitches. Row 2: Slip first stitch knitwise. *K1, P1* across, Knit last 2 stitches. Row 4: Slip first stitch knitwise. Knit all stitches. Row 5: Slip first stitch purlwise. Purl all stitches. R6-57: Repeat Rows 4 and 5. R58-115: Repeat Rows 4 and 5. R116-173: Repeat Rows 4 and 5. R174-231: Repeat Rows 4 and 5. R232-289: Repeat Rows 4 and 5. R290-347: Repeat Rows 4 and 5. R348-405: Repeat Rows 4 and 5. R406-463: Repeat Rows 4 and 5. R464-519: Repeat Rows 4 and 5. Cast off all stitches in rib pattern (*K1, P1*). This amazing statement scarf evokes such a romantic feeling with the beautiful blend of grey, taupe, and cream. Look how gorgeously long it is! When I was pondering a name for this design, “The Longbourn Scarf” came to mind as I am a big Pride & Prejudice fan. Longbourn is the estate where Lizzie Bennet and her family live, and the colors reminded me of the English countryside in the winter time. One of my favourite scenes of the 2005 movie is when Lizzie locks eyes with Mr. Darcy as he is walking along the field in the foggy morning as the beautiful music plays (see this scene HERE). The browns of the field and grey mist evoke the same colours of this scarf- I was looking for an English name for this design, and I think Longbourn is very fitting (especially since the scarf is indeed very long haha) . The forecast was showing that it was going to snow all day when we were planning to photograph this scarf. When I asked Ryan if we should try for another day, he declared that the snow would make the photos even more epic! I am so glad we ventured out to take these photos as they look so beautiful with the snow bokeh in the background. Most of the shots included me with furrowed eyebrows and squinting eyes as the wind was blowing the snow into my face! I love how dramatic the photos look though, and they showcase the Longbourn Scarf beautifully! I adore these colours together, and I love seeing the grey + white and taupe + grey mix together in a random fashion. The width of this scarf makes it extra cozy as you can definitely burrow your face into it and shield you from the wind! This is one of my favourite scarf designs of all-time as it is such a classic in any wardrobe that will look good over any coat. I hope you enjoyed reading about the inspiration behind this piece and I hope you are inspired to try making one for yourself! 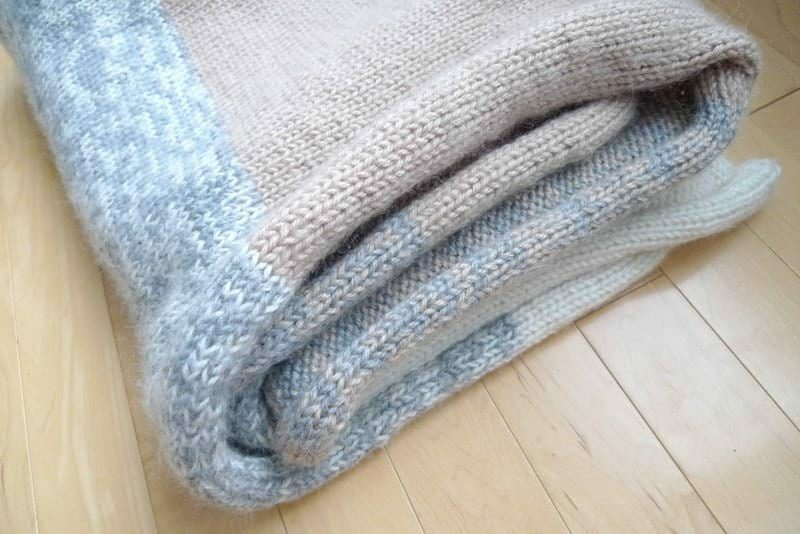 It is a very easy and relaxing knit, and you are rewarded with such a beautiful piece in the end. Lion Brand Yarn has put together a convenient KIT HERE that includes all the Touch of Mohair Yarn needed to make your own Longbourn Scarf! Happy knitting, everyone! I’ll have some new crochet designs coming up soon, so stay tuned!